HTML5 brings many features and improvements to web forms, there are new attributes and input types that were introduced mainly to make the lives of web developers easier and provide better experience to web users. So, in this post we are going to create a login page using HTML5 forms to see how the new added features work. Let’s take a look at the following markup. If you have been working with HTML forms before, this will look familiar. But, you’ll also notice differences there. The inputs have placeholder and required attributes, which are new attributes in HTML5. The required attribute will set the field to be mandatory and thus should not be left blank before the form is submitted, so when the user hasn’t filled in the field, the following error will appear. Using email input types can also give better experience for mobile users, like iPhone and Android users, where it will show the email-optimized on-screen keyboard with a dedicated “@” button to help type email address faster. The placeholder attribute, is only supported in modern browsers — Firefox 3.7+, Safari 4+, Chrome 4+ and Opera 11+. So, should you need it to work in unsupported browsers, you can use this polyfills in conjunction with Modernizr. The same thing goes with the required attribute. The error notification cannot be personalized, the error will remain “Please fill out this field” rather than “Please fill out your First Name”, this attribute support is also limited to the latest browsers. 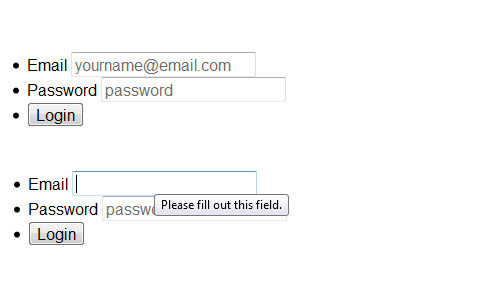 Alright, now let’s decorate our login form with CSS. First we will give the background a wood pattern in the html tag. Then, we need to remove the default padding and margin in ul tag that wraps the entire inputs and floats the li to the left, so the inputs will be displayed horizontally, side by side. Since we float the li, the parents will collapse, so we need to clear things around the parent with the clearfix hack. Lastly, we will give a little style decoration for the Submit button, as follows. That’s it, now you can try the login form from the following links. In this tutorial we looked into a few new features in HTML5 forms:placeholder, required and email input types to create a simple login page. We have also come through the downsides of the attributes, so we can decide a better approach to be applied. In the next post we will look into another new HTML5 form features, so stay tuned.